Mayor John Henry and Qian Je, the assistant director of foreign affairs for the Wuxi New District, hold the friendship agreement between the two cities. (Joel Wittnebel/The Oshawa Express). Oshawa’s making some new friends. 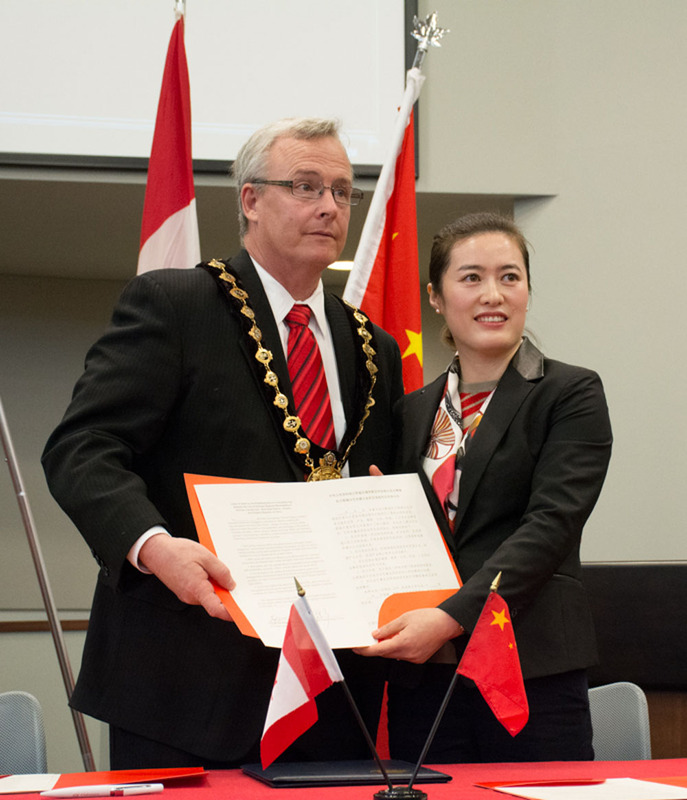 Mayor John Henry, along with members of city council, hosted a delegation of Chinese government officials for the signing of a friendship agreement between Oshawa and suburb of Wuxi New District. The agreement is a notice of intention to improve communication and the exchange of ideas or resources between the two cities. Oshawa has similar agreement with a pair of other Chinese cities, and for Mayor Henry, this agreement was a logical move. Located in the Jiangsu province on China’s eastern edge, Wuxi (pronounced woo-shi) of approximately 600,000 poeple was founded in 1992. In that time, the district has quickly become one of the country’s most innovative technology hubs. Developments in the sectors of micro-electronics, bio-pharmaceuticals and airport logistics have led the district to be named China’s fifth best city of business and second most innovative, according to a news release from the city announcing the new partnership. The Chinese delegation led by Qian Je, the assistant director of foreign affairs for Wuxi New District, appeared in Oshawa on behalf of Wei Duo, the director of the administrative committee of Wuxi. In addition to the new agreement with Wuxi, Oshawa also has international friends in Louyang, China through a friendship agreement signed in 2013, and a memorandum of understanding, akin to a friendship agreement, signed with the Chinese city of Rizhao. Mayor Henry credited the beginnings of the most recent agreement to the Region of Durham, who operate an economic development office out of Wuxi. Henry says there are no costs attached to signing such an agreement. Friendship agreements are nothing new to the municipalities of Durham. The region itself holds similar agreements with Changing and Zibo City, Brock Township holds a friendly exchange agreement wth Wuxi, and Pickering has links with Tailing, Yuhang, Xianning, Jining and Jinhua cities. But despite these agreements, Chinese investment in the country has dropped in recent years. According to the University of Alberta’s China-Canada investment tracker, 2014 saw 35 investments worth more than $2 billion – a sharp drop from 2013, which saw 48 investments valued at more than $15 billion.